I love edible flowers, they make a perfect decoration for smoothie bowls or any other dish you want to give a floral touch to, plus some of them taste as amazing as they look! Now artichokes aren’t really decorative foods, but when it comes to edible flowers they are my favourite, baby artichokes, big artichokes, they are all equal to me and I could eat them for days. Normally I just cut off the tops of the leaves and throw them in a pot of boiling water and eat them with a little dip on the side, but roasting them takes them to a whole other level of awesomeness. This way you can add even more flavour to the already delicious flowers! 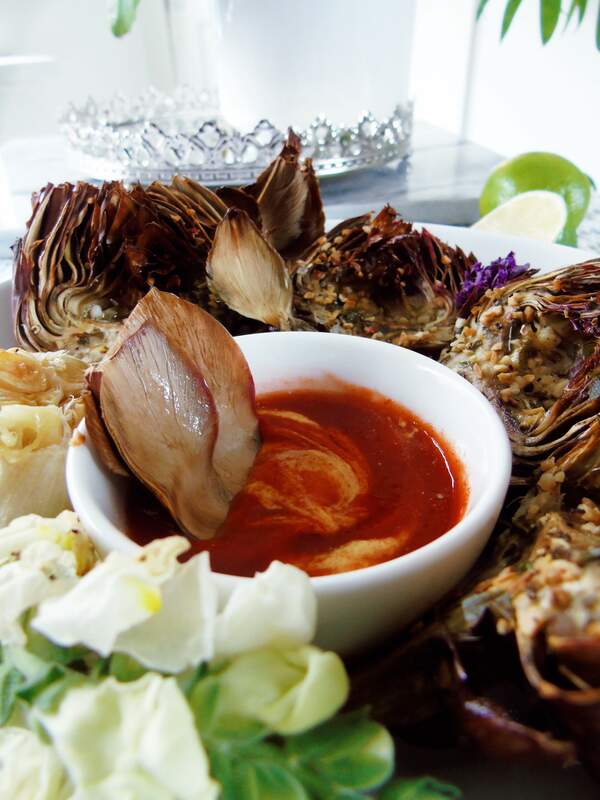 Tip: Whenever you buy an artichoke make sure to eat it as soon as possible! you can keep them for a couple of days but the quality of the product will quickly decrease, so don’t let them sit out too long. 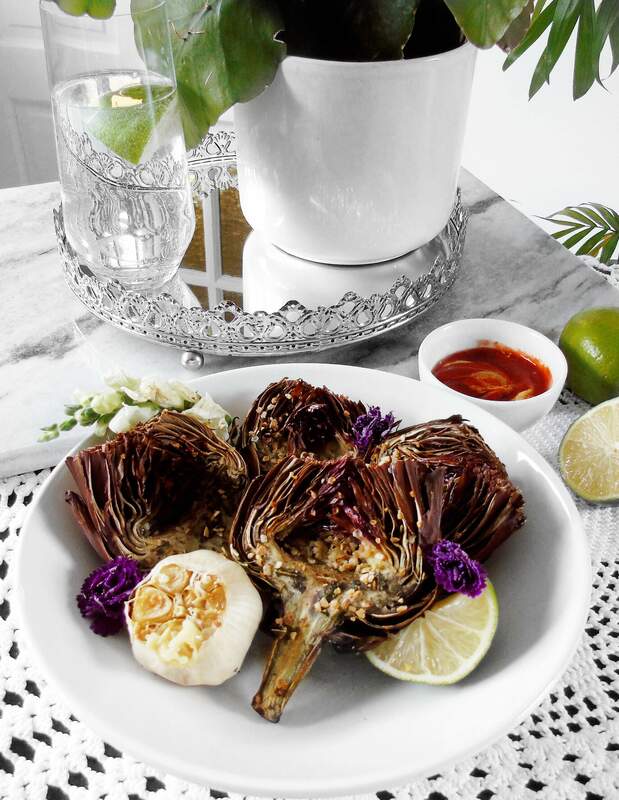 One thing to keep in mind if you’ve never had artichokes is that you will not get a complete meal, this is an appetizer or snack. It takes a bit of preparation and might seem anti climatic, but it’s all about the taste, remember it’s about quality, not quantity. I made a little dip to go along with the artichokes, but honestly you don’t need it! They are perfect as is, but if you do want to make a dip, I mixed a little bit of mustard with some hot sauce, added a little squeeze of lime juice and bam! Just the way I like it, hot and spicy. As for spices I used cayenne, dried basil and garlic chips. You can use garlic powder if you’d like, but dried garlic chips add a nice crunch to the final dish, yum! If you like this recipe or have any questions or suggestions feel free to leave a comment below and tag me in your recreations on Instagram. Perfectly roasted garlic baby artichokes. Start by preparing the artichoke and preheat the oven to 200 celcius or 400 farenheit. Snap of the bottom most outer leaves (about 2 layers). Now cut to remove the upper part of the artichoke (I use a serrated knife) cut away about an inch from the top. 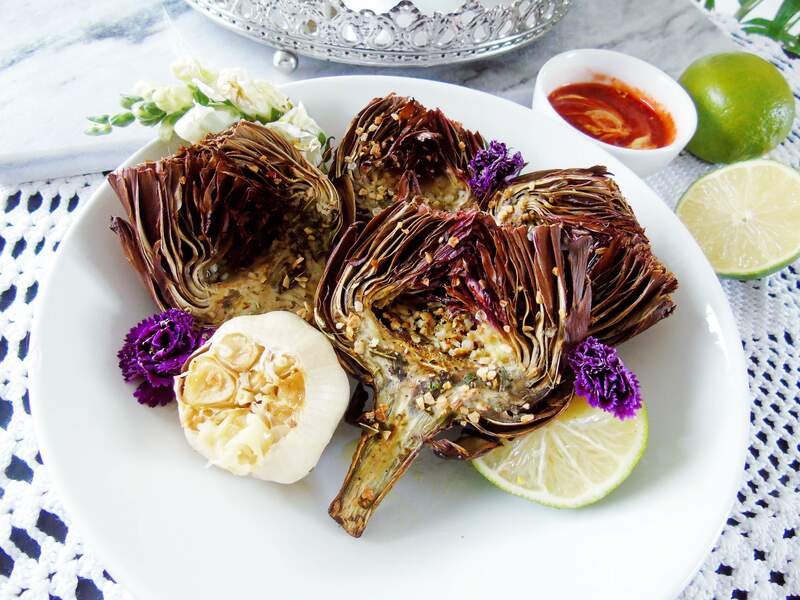 Now cut the artichoke from bottom to top into half and quickly squeeze some lemon or lime juice over the exposed parts of the artichoke to prevent browning. with a little spoon remove the fuzzy part of the artichoke also known as the choke. 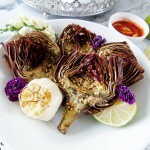 Place the artichokes in a baking dish (leaves down) and sprinkle the garlic chips (or powder), dried basil, cayenne and salt an pepper and divide it over the artichokes. Now drizzle some extra virgin olive oil to coat the artichokes and place them into the oven for about 25 minutes (depending on the size of your oven). You can check if they are done by poking the core aka the heart of the artichoke with a skewer, to see if it will easily go through, if so it is done.